Central Air Conditioning is a cooling system that circulates cool air to all or most of your home through ductwork which can be inside your walls, floors or ceilings. The registers where the cool air comes out can be mounted on your walls, floors or ceilings. 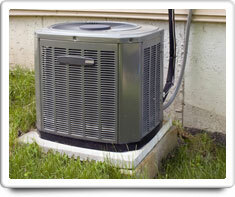 Central Air Conditioning has relatively expensive components (outside condenser unit, and inside blower and motor unit) and uses a significant amount of energy to operate. Your air conditioning unit actually performs three functions: cooling, dehumidifying, and filtering out particulates from the air. Your central air conditioning ductwork may be integrated as part of your home HVAC (heating ventilation and air conditioning) system. Central Air Conditioning is different than a 'Room Air Conditioner,' which typically mounts in a window or on the floor, and does not have distribution ductwork. If you have Central Air Conditioning, you may also have related home features such as: a Whole-House Humidifier; a Heat Pump (traditional); a Geothermal Heat Pump; Electronic Air Cleaner; Fresh Air Heat Exchanger; or Forced Air Heat which uses the same ductwork as your Central Air Conditioning. If you have any of these, you should put a checkmark for them as home features in your Home Wizard app, in addition to Central Air Conditioning. Proper maintenance will help reduce unscheduled repairs to your home air conditioning system. Dehumidifier, Forced Air Heating, Heat Pump (traditional) and Humidifier. Shown in the 'Routine Care' section are the recommended routine maintenance tasks for your central air conditioning. The 'Q & A' section shows answers to common questions. And the 'Articles' section provides helpful articles about your central air conditioning.